This is a reduced version of a mosaic from NASA's Mars rover Curiosity containing 1.3 billion pixels in the full-resolution version. 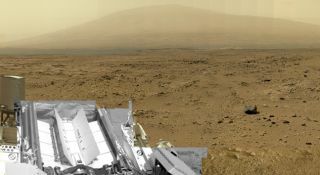 It shows Curiosity at the "Rocknest" site, where the rover scooped up samples of windblown dust and sand, and was released on June 19, 2013. Viewers can explore this image with pan and zoom controls at http://mars.nasa.gov/bp1/. A new 1.3-billion-pixel image from NASA’s Mars rover Curiosity allows viewers to zoom in and investigate part of the Red Planet in incredible detail. The huge mosaic stitches together nearly 900 photos that the Curiosity rover took with some of its 17 cameras during the robot's exploration of Gale Crater on Mars, NASA officials said. "It gives a sense of place and really shows off the cameras' capabilities," Bob Deen, of the Multi-Mission Image Processing Laboratory at NASA's Jet Propulsion Laboratory in Pasadena, Calif., said in a statement. "You can see the context and also zoom in to see very fine details." The new image is the first NASA-produced view from the surface of Mars that's larger than 1 billion pixels, officials said. It's a full-circle scene centered on the site dubbed "Rocknest," where Curiosity gathered its first scoops of sandy soil for analysis. The 3.4-mile-high (5.5 kilometers) Mount Sharp looms in the distance. You can access the full-resolution, zoomable image at: http://mars.nasa.gov/bp1/ . Deen constructed the mosaic using 871 pictures from Curiosity's Mast Camera instrument and 25 black-and-white frames from the rover's navigation cameras. The photos were taken between Oct. 5 and Nov. 16, 2012, officials said. Curiosity landed inside the 96-mile-wide (154 km) Gale Crater on Aug. 5, 2012, kicking off a planned two-year surface mission to assess Mars' past and present potential to host microbial life. In addition to its 17 cameras, Curiosity also carries 10 different science instruments to aid its quest. The six-wheeled robot has already checked off its primary goal. Mission scientists announced in March that a spot near Curiosity's landing site called Yellowknife Bay was indeed habitable long ago. The foothills of Mount Sharp, which lie about 5 miles (8 km) from Yellowknife Bay as the crow flies, have long been Curiosity's ultimate destination; mission scientists want to read the history of Mars' changing environmental conditions like a book as the rover climbs up the mountain's lower reaches. Curiosity is wrapping up activities near its landing site and should be ready to start the roughly year-long journey to Mount Sharp in the coming days, mission team members have said.